It's China, late second century. The collapse of the Han dynasty has created chaos of unforeseen complexity, and China is now divided into many small states. There is an ambitious warlord, Cao Cao, who wants to reunite China, but he is not alone ... Well, what did you expect? I mean, who wouldn’t want all of China for himself? Anyone? In the beginning of the game you choose whether you want historical or random conditions, and the time period. After that, the game begins. As a ruler, you have a lot of freedom. You can improve cities, draft troops, build weapons, search for useful people ... Simply put, you have a lot of things you can do. Naturally, most of these things are done by someone else, so you have to choose the right people to do the right things. Advisors are important too, as they can make decisions in state matters much easier. A small detail I like in particular is diplomacy. When you send someone to negotiate, you can see how the whole negotiation process goes on - it’s like a short dialogue. I know ... nothing too fabulous, but I always enjoy such details in a game. People are an important part of the game. One can never have enough skilled officials. You can reward them (i.e. - by giving them an item which will increase their strength) to increase their loyalty, change their positions (make a military officer a civil officer, etc.) or fire them. Speaking of people, you must (just like every good ruler) care even about ordinary people. You simply must buy their favour by brib- erm ... giving gifts (giving out food for free), or else they may decide you’re not quite the ruler they’d like to work for and rebel. Also, you may hire soldiers instead of drafting them. The military is also important, and I’d say it’s quite accurate. Even a small, well-trained elite force can successfully defend your city against a large army consisting of untrained peasants. You can arm your soldiers with crossbows, give them horses, etc. Also, another plus for this game is the interesting battle system which more or less repeats itself in most of KOEI's games. It’s hard to describe, but it’s rather simple to understand. The good thing is that while the game is realistic, it isn’t all that complicated, which is where I think its greatness lies. I can think of only one downside, and that is the AI, which can be a little dumb ... but is more or less OK. So, how good is the game? It's excellent! A real classic, very well-balanced and very replayable. I give it 4 out of 5.
t's one of those hardliner-strategy games, you really gotta WORK while playing this. No no no - it IS fun. Well, it seems so - I haven't played it THAT much, but I think it's worth a try if you are looking for a strategy game with real substance. Also seems quite realistic, very much options, pretty much details - yeah, good thang for a long night playing! There are some historical scenarios which you might play. If they really stick to reality - well, sorry, but really don't know much asian history... But that is exactly one aspect, I find interesting in this game. If you're fed up with the sixthousandth "Napoleon at Austerlitz" or the war of secession or stuff like that, I'd say: Go East! Try it out, if you don't fear numbers and stats - don't be afraid, there are some graphics (pretty well done, regarding the fact, that it seems to be just EGA). After the disappointingly easy Romance of Three Kingdoms 2, KOEI revamped the whole engine and introduce many enhancements for the third game in its flagship series. The results are mostly positive, although some might argue that the game is still much easier than the first game. There are many enhancements and new features. First, RtK 3 places a much stronger emphasis on tactical battles. The game debuts the attractive isometric view of the battlefield, which makes commanding your army more exciting. It also introduces new units such as crossbow, strong crossbow, and cavalry. Size of castles are more realistic in the isometric view, and you can actually place units at various points inside the castle if you are defending against an invasion. Capital Cities such as Luoyang and Xu Chang have bigger castles compared to other towns, spanning almost the entire screen. This makes it more difficult to capture these cities, as the castle can house many more units of the defender. There are also several new tactics, such as ambush and pitholes if an advisor is present in battle. On the downside, the game is much easier than RtK 1 if you have intelligent advisors (with 95 or above intelligence score). This is because their advices are so accurate that you already have a good chance of winning if you just blindly do what they say. Still, longer and more involved tactical battles help lengthen the game, especially in late stages when you are trying to break down the last strongholds. Overall, RtK 3 is a fine sequel to a great series. 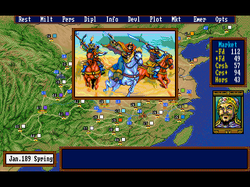 Attractive VGA graphics and great soundtrack help bring medieval China to life. To prevent the game from ending too soon, though, play as a custom character instead and don't ask for advice from your advisors .